Originating in Asia and the Pacific Islands, Hibiscus rosa sinensis is the national flower of Malaysia. 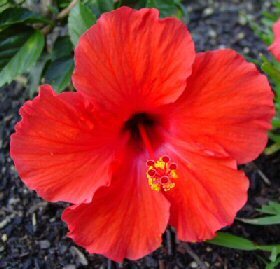 It is closely associated with Hawaii, however, the state flower of Hawaii is a native species of hibiscus, H. brackenridgei. There are many colors of hibiscus with various size blossoms. 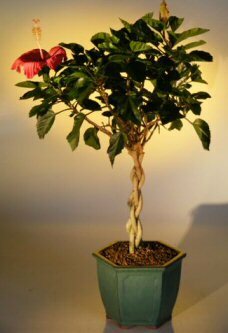 Our hibiscus is trained with a braided trunk and has 2" diameter, red color blossoms which appear during spring, summer and fall and even during the winter if kept sufficiently warm. 12 years old, 21" - 25" tall.